As you develop an e-learning course, you have to make decisions about numerous design elements that will influence learners’ reception of the course. And though its name diminishes its importance, the background is a critical element for first impressions. 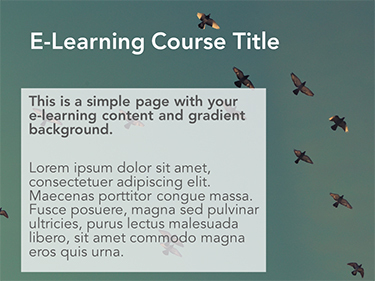 Many e-learning courses use a solid color, or white, for the background, but oftentimes neutral hues can also work with foreground elements without becoming obtrusive or restricting. They can make your course look clean and elegant, and draw the attention to the content rather than the design. Don’t be afraid, though, to give bright and vibrant colors a try. Brighter colors can feel more energetic, while darker shades typically invite relaxation and heightened focus. Just make sure your text has enough color and heft so learners can read it without straining. Also, with a colorful background, try to keep the design simple and other colors to a minimum. For more on color, check out Nicole’s article on The Color Effect: How Your Palette Affects Learners. 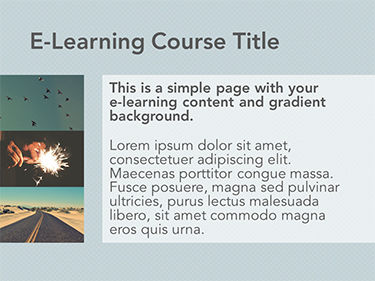 Gradients are another popular choice for e-learning backgrounds. They give the page a bit more depth and can make it look more lively. Usually, gradients fade to white/light or black/dark, but you can also set them up to blend several colors. Another option, which achieves a similar result, is a blurred background effect. We have a great set of these backgrounds ready for you as a free download here: Blurred Backgrounds 1 and Blurred Backgrounds 2. Patterns also create a sense of depth and texture on the page. They can really make design elements pop, yet need to be subtle enough so as to avoid distracting people. They can be created from lines, shapes, or even small images with any kind of color scheme. Just keep in mind that subtle patterns should be just that—subtle—and shouldn’t compete with other elements on the page. Large or oversized patterns can be pretty trendy but use them with caution: they can draw the learner’s attention away from the material and limit the content you place on them. A safer bet is to combine them with subtle elements to keep the design balanced. Want to try one out? We have a Soft Pixel Background available for you in the downloads area of our community. Using photographic images or illustrations as backgrounds can tell a story and define the stage for your e-learning course. If chosen well, your learners will immediately know the theme of the course or module. They can create a certain mood or atmosphere and spark the learner’s imagination. This type of background can be so engaging that your learners might not even notice the difference between background and foreground. For this purpose, you will need high-resolution images; however, they shouldn’t be so big that the file and download size of your course becomes unmanageable. They should also include open areas on which you can place other elements, such as text or buttons. And, be sure to match your background image orientation with your course’s layout. As you can see, even with the same content, the background makes quite a difference. If you’re working with Articulate Storyline, don’t forget to check out my article on Creating Your Own Background Image in Storyline. What are your preferences when you choose a background? Please share them in the comments below. Make sure you follow us on Twitter and come back to E-Learning Heroes regularly for more helpful advice on everything related to e-learning. Sometimes I find myself spending way too much time trying to decide on the perfect background image. When faced with infinite possibilities, I quickly feel decision paralysis. This is a post I know I will come back to time and time again because it will help to narrow my focus into one of the four categories. Thanks! Excellent article. I love how it explains the pros and cons for each type of background. Thank you .